With effortless grace, celebrated author Chimamanda Ngozi Adichie illuminates a seminal moment in modern African history: Biafra's impassioned struggle to establish an independent republic in southeastern Nigeria during the late 1960s. We experience this tumultuous decade alongside five unforgettable characters: Ugwu, a thirteen-year-old houseboy who works for Odenigbo, a university professor full of revolutionary zeal; Olanna, the professor&#8217;s beautiful young mistress who has abandoned her life in Lagos for a dusty town and her lover&#8217;s charm; and Richard, a shy young Englishman infatuated with Olanna&#8217;s willful twin sister Kainene. Half of a Yellow Sun is a tremendously evocative novel of the promise, hope, and disappointment of the Biafran war. This is a great book written by a fellow author and tribesperson. The Biafran war and experience remain active in many people's minds - especially those from the Bifran side of the conflict. It is always interesting to read accounts of this war, no matter how they are narrated. This was a great effort by Ms. Adichie! Resonating against the backdrop of current-day events in The Sudan is remarkable young author Chimamanda Ngozi Adichie's engrossing story set during the brief history of Biafra, a breakaway area of Nigeria that had a short, bloody existence as a nation during the 1960s. In the post-colonial era when many new African nations were born, many native Nigerians saw their new government as little more than a black version of their white European oppressors. Achidie's lead character, Professor Odenigbo, an ethnic Igbo, lives comfortably, to the extent that he can hire a houseboy, 13-year-old Ugwu. These two main characters provide the adult, academic and child's-eye, non-academic view of both revolutionary rhetoric and action. Adichie's story of revolution is also a family story as Odenigbo's beautiful girlfriend Olanna, her twin sister Kainene, and her boyfriend, white author/journalist Richard become involved. Peripheral characters also play an important role in the interpersonal plot development. Adichie does a wonderful job describing the lives of various classes in Nigerian society - haves, middle-class and the dirt poor inhabitants of refugee camps. For me, she struck her only wrong note with a series of chapter summaries from a book being written by Richard. I felt that these could have been expanded to real chapters or left out. 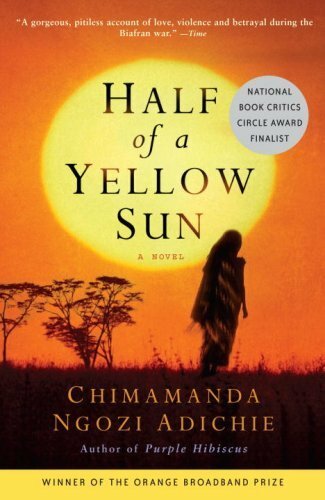 "Half of a Yellow Sun" refers literally to the design of Biafra's national flag. Ironically it also represents the reality of this small country, on which the sun never truly rose. Highly recommended to readers of historical fiction, and to those who want to learn more about life in Africa. Four strong stars. Two African Igbo sisters and their families get caught up in the Nigerian civil war of the 1960s which culminated in the attempt to form the Republic of Biafra. Don't worry if you shy away from dry historical tomes. This novel centers itself in the absorbing domestic tensions between the complex, three-dimensional characters: Ugwu, a perceptive young houseboy who works for the somewhat pompous revolutionary professor Odenigbo; Olanna, a beautiful woman who loves Odenigbo; Kainene, her plain but resourceful twin sister; and Richard, the white Englishman who's in love with Kainene. The viewpoints are Ugwu, Olanna, and Richard. The best novel I've ever read! Several times while reading I was brought to the point of tears, clutching the book to my chest and kept looking at the author's picture on the back of the book because I couldn't believe that someone so young could harness such brilliance. A true tour de force! Don't miss this one! We know from the blurb that this is a novel about the civil war in Nigeria; but it all begins placidly enough around 1962. Ugwu, a 13 year old boy from a poor village, is taken on as a houseboy by Odenigbo, a mathematics lecturer at the university of Nsukka, near Enugu, in the South-East of Nigeria, the area that would in 1967 be known as Biafra. (It would have been helpful if the book had included a map of Nigeria for those readers unacquainted with its regions and its geography.) He lives with the beautiful Olanna, who is back in Nigeria after having got a Masters Degree from London University, and who has moved from her home town Lagos (where the majority population was Yoruba) to Nsukka to be with him. They are all Igbos. Olanna has simple but much-loved relatives at Kano in the North, where the majority population are the Muslim Hausa. When she visits them there, "she felt that things were in order, the way they were meant to be" (p.39) Also in Nsukka, working on a book, is Richard Churchill, the shy English lover of Olanna's sister Kainene, who lives in Port Harcourt (the main port of what would become Biafra). All these characters and the relationships between them are well described, and they would have made an interesting novel on their own, even without the later parts about their experiences during the war. The first section of the book brings to life many facets of Nigerian life (and food): the first-generation educated intelligentsia, so different from their parents and resentful of colonialism and neo-colonialism; the sleazy politicians; the servants; a host of Igbo expressions (though they are not always translated). Occasionally tribal differences are touched on, but nothing except such knowledge as readers may already have had prepares them for the ferocity that these differences will engender after Igbo officers overthrew and murdered Abubakar Balewa, Nigeria's first President and a Northern Muslim, in January 1966. A counter-coup, supported by the Hausas and the Yoruba, put General Gowon in power in July 1966, and Igbos were attacked in Lagos and massacred in the North. The Igbos then proclaimed the independence of their region in May 1967 and called it Biafra. (Its flag had on it half the yellow sun of the title). In July that year Gowon launched an attack on the secessionist state. The Biafran War began. Eventually Biafra was battered and notoriously starved into capitulation (1970) after Port Harcourt had fallen. These events naturally impinge on our cast of characters. Olanna is in the North when the massacre begins, and manages to escape back to Nsukka; Richard, too, returning via Kano airport from a visit to England, is a traumatized witness. Enugu, Biafra's first capital, and Nsukka, near the northern border of Biafra, had to be abandoned when the Nigerian army comes close to it. Odenigbo, Olanna and Ugwu move to Abba, Odenigbo's home town, which replaced Enugu as the capital; then have to move again, to Umuahia, the next capital; and then that town falls also. They experience air raids, food shortages, press-ganging and lawlessness, of all of which we have graphic and haunting images. The book is divided into four sections, called respectively `The Early Sixties', `The Late Sixties', `The Early Sixties' and `The Late Sixities'. In other words the first and third sections are about the period before the war, while the second and fourth deal with the impact of the war. So in the second part there are unexplained allusions to the third. This kind of device works for the kind of novel in which the revealing of some secret is essential to the plot; but the point of it in this book escapes me. But this is a small niggle about a memorable book about unforgettable people and about a war that should not be forgotten. Chimamanda Ngozi Adichie has excelled herself and the literary World with this outstanding story following the lives of 3 Nigerians and a British man during the suffering of the Nigerian Civil War. This was another book that I couldn't put down, although the characters are fictional the detail of the political backdrop is factual and an education to those more naive to the history of this African country. "Half of a Yellow Sun" is Adichie's second novel. Her first, "Purple Hibiscus," was short listed for The Orange Prize in 2004, and this second is short listed for The Orange 2007. "Half of a Yellow Sun" is an epic set in Nigeria in the 1960s. It opens in the early 1960s with a young village boy, Ugwu, being taken by his auntie to his new job as house servant for an educated university employee, Odenigbo, at Nsukka university. Soon afterwards, Odenigbo's beautiful lover Olanna moves in. Olanna, like her twin sister Kainene, has been educated in London, and her wealth parents are not happy about her moving in with her academic lover. The reader is introduced to an array of colorful characters and quickly caught up in the events which occur on a domestic level, such as Olanna's life with Odenigbo and her less attractive, more cynical twin's relationship with an Englishman called Richard. But on the horizon, there are rumblings of dissent politically. The middle classes are at first interested in an intellectual way, and then, like the rest of their countrymen and women, involved directly in the increasingly dramatic course of events. Adichie's novel is full of funny and tender moments as well as the terror and disruption of war. The first coup is followed swiftly by reprisal attacks on the Igbo tribes people by the Northern Hausa Fulani Moslems, and the breakaway state of Biafra is formed. The novel brought about an in-depth appreciation of the trauma of the civil war! Beyond war, it demonstrated a profound display of loyalty and commitment by a house servant, Ugwu to an entire family which in turn earned him immense up-swing in exposure level, literacy and human relations. There was so much bonding and love expressed between Olanna and Kainene irrespective of the fundamental breach of trust by Olanna's affair with Richard. The classical divide and rule tactics subtly employed by the British along with other major powers in a bid to control indirectly Nigeria and its resources was subtly made evident in the script. Odenigbo and his associates western-style academic and blossom social life gradually declined to subsistence or in fact non-existence. This clearly and marvelously threw the reality of agony of war in the face of an average reader. Although fictional, it remains the greatest narration of Biafra war history that I have read so far. It provides me with a more empathetic position towards the group affected as well as all modern wars of today with the underlining reason being self-seeking economic gains. Adichie did a fantastic job and is clearly an exceptional author with immense future potentials. Like the events of Rwanda and Uganda, the true depth of the tragedies of the Nigeria's civil war largely escaped the Western world's consciousness and are only brought to light in remarkable books like Adichie's "Half of a Yellow Sun." Biafra's ill-fated struggle to establish an independent nation is beautifully and elegantly told through the eyes and voices of twin sisters of wealth Olanna and Kainene, and a highly intuitive 13-year old houseboy Ugwu. Olanna is mistress to a highly ideological university professor Odenigbo who fervently supports Biafran independence. Kainene is married to a British expatriate Richard who is enamored with the land and its culture. All find their own reasons for remaining in Biafra. And through them we learn how the people lived, loved, starved and suffered during this tumultuous period. This is a recent winner of the Orange Prize, and deservedly so. Adichie's wonderful narrative skills are showcased in this book, in which she relates the post-colonial horrors in Nigeria, which, like most African nations, is comprised of many different regions, which co-exist within artificial boundaries drawn by the European powers that formerly controlled the area. In drawing these boundaries, little concern was shown for the historic African boundaries or population groups. This book, like "The Poisonwood Bible" and "The Darling", made me so angry at the countries which colonized and converted African countries and then left them in total chaos, no longer able to function on their own, an entire continent fractured and dependent. Before colonization, Africa's tribal culture and systems worked for its peoples, but the white man destroyed these. Perhaps the Africans did not live the way Westerners want to live, but who are we to say that their way was wrong? In 1967, Nigeria's Igbo people, living in the eastern part of the country, seceded and formed the independent republic of Biafra, thus touching off a three-year civil and ethnic war of such horror, barbarism, and mass starvation that can hardly be imagined. We see a people totally unprepared for the ravages of war: cut off from the rest of the world, babies dying, unable to get the barest necessities of life. The reader is struck by the naivet¨¦ of the Biafrans who believed that they could actually win against the Nigerian forces. One reviewer bluntly said that Biafra was another child of war, dead at birth. By early 1970, starved into submission, the Republic of Biafra ceased to exist. Rather than a story of the war, Adichie tells a story through the minds and experiences of several well-developed characters as she explores the ethnic prejudices of the Africans and the religious differences of Muslims versus Christians in Nigeria as its social fabric was torn apart. The presence of oil in the eastern part of the country made it unthinkable that one ethnic group could control it. Oil and religious differences....hmmmm, does that sound familiar? The stories of affluent twin sisters, their families, friends, and servants are seamlessly woven together as they struggle to survive the atrocities and brutality of war and starvation yet try to keep their dream alive. It is a story of war, love, ideals, compromise, loyalty, betrayal, and the culture of Africa. In 1967, a significant portion of southern Nigeria declared independence as the nation of Biafra. An ugly civil war (what other kind is there?) ensued, ending with Biafra's defeat. Adichie recreates the feeling of that period as she follows three fictional characters on the Biafran side of the conflict: Ugwu, a little boy who works for a Nigerian mathematics professor; Olanna, the professor's partner; and Richard, an Englishman and aspiring writer whose partner is Olanna's twin sister. From these three viewpoints, we follow this family from soon after independence to the end of the war. Although Adichie makes no claim that she is recounting history (in her author's note, she writes, "I have taken many liberties for the purposes of fiction; my purpose is to portray my own imaginative truths and not the facts of the war"), the book really feels authentic, like it captures the hope, the passion, and then the exasperation and disillusionment that evolved in the course of the war. I was left sobered. Upon finishing, I reached to pick up another book and had to put it down, needing time to process Adichie's powerful illustration of her father's adage: agha ajoka (Igbo for "war is very ugly"). The professional reviews have been very favorable. The San Francisco Chronicle called it "profoundly humanistic." The Guardian says that Adichie brings to the history of this war "a lucid intelligence and compassion, and a heartfelt plea for memory." They are correct: Read this book.